The BMP-3 is a Soviet and Russian infantry fighting vehicle, successor to the BMP-1 and BMP-2. The abbreviation BMP stands for boevaya mashina pehoty (боевая машина пехоты, literally "infantry combat vehicle"). The design of the BMP-3 or Obyekt 688M can be traced back to the Obyekt 685 light tank prototype with an 2A48-1 100 mm gun from 1975. The prototype did not enter series production, but the chassis, with a new engine, was used for the next-generation infantry combat vehicle Obyekt 688 from A. Blagonravov's design bureau. The Ob. 688's original weapon configuration consisting of an externally mounted Shipunov 2A42 30 mm autocannon, a 7.62mm PKT machine gun and twin 9M113 Konkurs ATGM launcher was rejected; instead the new 2K23 armament system was selected. The resulting BMP-3 was developed in the early 1980s and entered service with the Soviet Army officially in 1987. It was shown for the first time in public during the 1990 Victory Day parade and was given the NATO code IFV M1990/1. The BMP-3 is designed and produced by the Kurganmashzavod ("Kurgan Machine Building Plant") some variants however are built by the Rubtsovsk Machine Building Plant (RMZ), for example the BRM-3K. In May 2015, the Russian Defense Ministry signed a three-year contract to receive "hundreds" of BMP-3 vehicles to maintain its armored vehicle force until its replacement, the Kurganets-25, completes research and development. In the process of the BMP's serial production, the vehicle's design underwent 1,500 amendments. In the Army-2017 show, the Russian Defence Ministry signed a contract covering the first deliveries of an unspecified number of BMP-3 infantry fighting vehicles (IFVs) fitted with the Bumerang-BM turret. The BMP-3 saw action with the Russian forces during the First Chechen War. In 2000, the United Arab Emirates deployed some BMP-3s in peacekeeping operations during the Kosovo War. The BMP-3 also saw military use with Emirati forces during the Saudi Arabian-led intervention in Yemen, where it is currently deployed. The BMP-3 is one of the most heavily armed infantry combat vehicles in service, original version of BMP-3 has a turret fitted with a low-velocity 2A70 100 mm rifled gun, which can fire conventional shells or 9M117 Bastion ATGMs (AT-10 Stabber). 40 100mm-rounds and 8 ATGMs are carried. A 2A72 30 mm dual feed autocannon with 500 (300 HEI and 200 APT) rounds and a rate of fire of 350 to 400 RPM, and a 7.62mm PKT machine gun with 2,000 rounds, all mounted coaxially in the turret. The main gun elevates from −5° to +60°. There are also two 7.62mm PKT bow machine guns, again with 2,000 rounds each. The BMP-3 is capable of engaging targets out to 5,000–6,000 meters with its ATGM weapon system 9K116-3 "Basnya". With conventional ammunition, such as the HE-Frag shell 3OF32, the 2A70 gun has a range of 4,000 meters. According to the manufacturer's web-site, all weapons can be fired from the halt, on the move, and afloat with the same effectiveness. The ability to hit targets on the move with missiles was successfully demonstrated during competitive evaluations in the UAE in 1991. The turret is fitted with the 2K23 system, which consists of an autoloader with 22 rounds (the remaining 18 rounds are stored in the hull), a 1V539 ballistic computer, a cross-wind sensor, a 2E52-2 stabilising system, a 1D16-3 laser range finder, a 1K13-2 gunner's sight/guidance device, a PPB-1 gunner's sight and an OU-5-1 IR searchlight. Optional autoloader for ATGM missiles is also available. The commander has a combined optical sight 1PZ-10, a day/night vision device TKN-3MB and an IR searchlight OU-3GA2. Since 2005, the BMP-3 can be fitted with a new fire control system from the "Peleng" Joint Stock Company from Belarus. This consists of a SOZH-M gunner's main sight with an integrated laser range-finder and missile-guidance channel, a Vesna-K targeting system with thermal imaging camera and automatic target tracker AST-B, an armament stabilisation system, a ballistic computer with data input sensors and a PL-1 IR laser projector. Since 2017, the BMP-3 is fitted with a new fire control system from the "Vologda Optical-Mechanical Plant" from Russia. This consists of a Sodema two-plane stabilized gunner's main sight with an integrated laser range-finder and missile-guidance channel plus a SOZH-M thermal imaging camera. Standard equipment includes five firing ports with associated vision blocks, an R-173 tranceiver, an R-173P receiver, a GO-27 radiation and chemical agent detector, an FVU filtration system, an automatic fire extinguisher and six 902V "Tucha-2" 81 mm smoke grenade launchers. BMP-3M is equipped with Bakhcha-U turret, which has similar weapons to the original BMP-3 turret but with a new dual-channel FLIR gunner's sight, commander's panoramic thermal imaging device, vertical-storage conveyor, new autoloader, and a new sighting system. It also has a stronger armor on the turret, and two-axis stabilisation. The turret of the BMP-3 has been fitted to the Patria Armoured Modular Vehicle and on the Turkish-UAE RABDAN 8x8 IFV. In August 2017, a BMP-3M was presented with a new ATGM remote weapon station fitted on the standard turret carrying two 9M120 Ataka (AT-9 Spiral-2) missiles. In June 2018, the Russian Defense Ministry announced that BMP-3s would be fitted with the AU-220M combat module equipped with a 57 mm cannon. The module can carry 80 rounds and fire 80 rounds per minute including air burst, high-explosive, fragmentation, armor-piercing and guided munitions with a maximum range of 14.5 km (9.0 mi), and can even punch through side armor of main battle tanks. The vehicle has an unconventional layout. The engine is in the back of the vehicle to the right (unlike most other IFVs, which have the engine located forward in the hull). As a result, the driver is seated forward in the hull (in the center) together with two infantrymen (one on each side of the driver). The vehicle has a double bottom and the engine is located under the floor of the vehicle (troops enter/leave the vehicle over the engine). The remaining five infantrymen are seated aft of the two-man turret. Early models were powered by a 450 hp engine UTD-29, but most BMP-3s are now equipped with the 500 hp UTD-29M version. The engine was developed at the Transmash Diesel Engine Plant in Barnaul. The BMP-3 has a range of 600 km, an altitude of operation of up to 3,000 m and it is transportable by train, truck, sea, and air. The BMP-3 engine is a diesel four-stroke, liquid-cooled design. The transmission is a four-speed hydromechanical power unit, with power takeoff to its water jets. The suspension is independent, with a torsion bar and six hydraulic shock absorbers. Steering is by gear differential with hydrostatic drive. The track adjusting mechanism is remotely controlled from the driver's station, with tension force indication. The water-jet propulsion unit is single-stage, axial, auger-type. The hull and turret are made of a high-strength aluminum alloy, with the front of the hull being provided with an extra steel plate welded over it plus spaced armor from the trim vane. The turret is also provided with a thick steel spaced armour shield over its frontal arc. Over the frontal arc, the vehicle is protected against 30 mm gun rounds at a range of 200 m. In addition to "hard" protection, the BMP-3's self-sealing fuel tank is located in front of the driver, directly behind the front armour plating. It is specially constructed to act as armour, effective against shaped charge warheads as well as any auto-cannon shells that managed to go through the front armour. The BMP-3 can create a smoke screen by injecting fuel into the exhaust manifolds. A chemical agent detector, an FVU filtration system, an automatic fire extinguisher and six 902V "Tucha-2" 81 mm smoke grenade launchers are standard. At least two distinct sets of explosive reactive armour kit are currently available, giving the BMP-3 protection from less advanced rocket propelled grenades. One of them is the Kaktus ERA kit, which has a unique design that creates minimal acoustic and kinetic backlash to the armour behind it upon detonation, thus ensuring that the occupants will not be harmed by shockwaves from the ERA block. The ERA blocks will completely disintegrate after detonation. According to Kurganmashzavod, the BMP-3 may also be fitted with additional side armor tiles, which can resist .50 caliber armour-piercing ammunition perpendicularly at close ranges. They give the BMP-3 added side protection from autocannon fire as well. The BMP-3 also has the ability to carry a Shtora-1 electro-optical jammer that disrupts semiautomatic command to line of sight (SACLOS) antitank guided missiles, laser rangefinders and target designators. Shtora is a soft-kill, or passive-countermeasure system. Standard weight of the vehicle is 18.7 tonnes. If additional armour overlay (metal sheet of armour and Kaktus ERA) is installed, weight will reach to 22.2 tonnes. The body covered from the sides and the top. In such kit, it is protected against 12.7 mm machine gun rounds in the range of 100–200 m.
BMP-3 – Basic version, as described. BMP-3M – KBP and Kurganmashzavod have upgraded the vehicle with a new engines and turret with a new ATGM system 9K116-3 Basnya. The upgraded vehicle is called the BMP-3M and the new Bakhcha-U turret which includes a new automatic fire control system with ballistic computer, new SOZH gunner's sight with laser rangefinder and an ATGM guidance channel, thermal imager, TKN-AI commander's vision device with laser illuminator and new ammunition loading system for ATGM. The BMP-3M is also able to fire various ammunition types, including new 100 mm laser-guided projectiles, new 100 mm HE-FRAG (high explosive fragmentation) rounds and new 30 mm APDS (armour piercing discarding sabot) rounds. Its additional auxiliary armour shields are effective against 12.7 mm armour-piercing rounds from a range of 50 m. Explosive reactive armour is available as an option. The new uprated engine is the UTD-32, which is rated at 660 hp. There are actually several different M models, some fitted with additional armour, "Arena-E" or "Shtora-1" active protection systems, air conditioner etc. BMP-3M Ataka – BMP-3M version with a two men turret armed with 30 mm 2A72 autocannon, and 9M120-1 Ataka ATGM. BMMP (bojevaya mashina morskoj pekhoti) – Version for naval infantry, fitted with the turret of the BMP-2. BMP-3K (komandnyi) – Tactical command variant, includes additional radio R-173, an intercom for seven users, an AB-R28 independent portable power unit, a navigation device TNA-4-6 and the "Ainet" air burst round detonation system. The BMP-3K lacks the bow machine guns and has its whip antennas mounted on the rear hull. Crew: 3+3. BMP-3F – Armed with the standard 2K23 turret. Specially designed for operations at sea, with improved seaworthiness and buoyancy, capability to move afloat at sea state 3 and fire with the required accuracy at sea state 2. Compared to the basic model, the vehicle design features changes increasing floatability and vehicle stability: the self-entrenching equipment is omitted, a lightweight anti-surge vane and an air intake tube are introduced; the BMP-3F turret is also protected by anti-surge vanes. Water jet propellers develop a speed of 10 km/h when afloat. The BMP-3F design allows the vehicle to come ashore under rough sea conditions and to tow the same-type vehicle. A new main sight, the SOZH, which has an integrated laser range finder and an ATGM guidance channel, is installed. This version can endure continuous amphibious operation for seven hours with the running engine. BT-3F – Amphibious version based on BMP-3F with the original turret replaced by a smaller remote weapon station with either 7.62, 12.7 or 14.5mm machine gun. It can accommodate a crew commander, driver, gunner, and 14 troops, and can use optional ERA armor. BRM-3K "Rys" (Ob.501) (boyevaya razvedivatel'naya mashina) – Surveillance and reconnaissance variant with 1PN71 thermal sight (3.7x/11x, 3 km range), 1PN61 active-pulse night vision device ( 3 km range), 1RL-133-1 ("TALL MIKE") I-band surveillance radar (3 km man, 12 km vehicle), 1V520 computer and a TNA-4-6 navigation system. The armament consists of the stabilized 30 mm autocannon 2A72 (600 rounds) and a coaxial 7.62 mm machine gun (2,000 rounds) or AU-220M Baikal remote weapon station with 57 mm BM-57 autocannon and 7.62mm PKMT machine gun. Combat weight: 19 t, crew: 6. In 1993, Russia started quantity production of BRM-3K vehicles. BMP-3 Dragoon – New IFV version with an unmanned turret which can be armed with a variety of combat modules, including standard BMP-3's Bakhcha-U turret with a 2A70 100 mm cannon, a 2A72 30 mm autocannon and a PKTM 7.62 mm machinegun, the AU-220M Baikal remote weapon station module with a 57 mm BM-57 gun and a module with a 125 mm 2A82-1M tank gun, the new 816 h.p. turbocharged UTD-32T engine and powerplant moved to the front, and a hydraulic ramp fitted to the rear. It is reported that its trials were finished in October 2017. BREM-L "Beglianka" (Ob.691) (bronirovannaya remontno-evakuatsionnaya mashina) – Armoured recovery vehicle with five-tonne crane and 20/40 metric tonne capacity winch. BMP-3 "Khrizantema-S" (9P157-2) – Self-propelled anti-tank version with 9M123 Khrizantema (AT-15) ATGM system with radar and laser guidance. The 9P157-2 carries two 9M123 missiles on launch rails, which are extended from a stowed position; the radar is also stowed during transit. The missiles are re-loaded automatically from an internal magazine with 15 rounds (missiles are stored and transported in sealed canisters) and can also accept munitions manually loaded from outside the vehicle. The manufacturer claims that three 9P157-2 tank destroyers are able to engage 14 attacking tanks and destroy at least sixty percent of the attacking force. The dual guidance system ensures protection against electronic countermeasures and operation in all climatic conditions, day or night. NBC protection is provided for the crew (gunner and driver) of each 9P157-2 in addition to full armour protection equivalent to the standard BMP-3 chassis and entrenching equipment. The 9M123 missile itself is supersonic, flying at an average speed of 400 m/s (Mach 1.2) and a range of between 400 and 6,000 meters. Entered service in 2005. More than 10 sets of new anti-tank guided missile (ATGM) complexes "Khrizantema-S" on the crawler, which replaced the complexes "Shturm", entered the artillery units of the Southern Military District, based in Ingushetia, in November 2012. Khrizantema vehicles are fielded with artillery units. 9P163M-1 "Kornet-T" – Anti-tank version with Kornet (AT-14) missile system. Some sources call it the 9P162. The Kornet is similar in function to the Khrizantema missile system. The 9P163M-1 carries two 9M133 missiles on launch rails, which are extended from a stowed position during transit. Missiles are re-loaded automatically by the tank destroyer from an internal magazine with 16 rounds (missiles are stored and transported in sealed canisters). Nuclear, biological and chemical protection is provided for the two crew members (gunner and driver) in addition to full armour protection equivalent to the standard BMP-3 chassis. The guidance system of the 9P163M-1 allows two missiles to be fired at once, the missiles operating on different guidance (laser) channels. The first Kornet-T missile carriers were delivered in 2003 to replace the Shturm-S, and the first batch of 20 vehicles entered service in 2012. The Kornet-T is used by motorized units. 2S18 "Pat-S" (Ob.697) – Self-propelled version of the 152 mm howitzer 2A61 "Pat-B". This was only a prototype, further development led to the 2S31 Vena. DZM "Vostorg-2" (dorozhno-zemlerojnaya mashina) – Combat engineer vehicle with a dozerblade and excavating bucket. Prototype. UR-07 (ustanovka razminirovaniya) – Mine clearing system. The UR-07 might replace the UR-77 "Meteorit". It has the same chassis as the BMP-3 but a bigger steel hull with two launch ramps in the rear. The ramps are used to fire rockets towing hose-type mine-clearing line charges to clear mine fields. UNSh (Ob.699) (unifitsirovannyj shassi) – Basic chassis for specialised variants. KhTM (khodovoj trenazhor) – Driver trainer. Hermes or TKB-841 – Air-defence vehicle with high-velocity missiles and radar system. Prototype. 2S25 Sprut-SD – Tank destroyer with 2A75 tank gun based on BMP-3 chassis. 2S25M Sprut-SDM1 – Modernized version of 2S25 Sprut-SD with 2A75M cannon and new fire-control system. 2S31 Vena – Self-propelled mortar carrier equipped with a 120 mm mortar based on BMP-3 chassis. It entered production in 1996 and service in 2010. 2S38 ZAK-57 Derivatsiya-PVO – Self-propelled air defense vehicle based on BMP-3 chassis fitted with a 57 mm autocannon and passive reconnaissance and target tracking equipment. It is designed to shoot down unmanned aerial vehicles (UAVs), cruise missiles, air-to-surface missiles, aircraft, helicopters, and MLRS rockets. 2S38 is equipped with a TV/thermal-imaging system with automatic target lock-on and tracking capabilities, a laser rangefinder and a laser guidance system. The optical and electronic target acquisition system can spot an aircraft at 6.4 km (4.0 mi) and using sectoral observation can detect aircraft over 12 km (7.5 mi) out. The cannon is fast enough to destroy targets traveling 500 m/s (1,100 mph; 1,800 km/h; Mach 1.5). Laser-guided, air burst and specialized anti-drone munitions for ZAK-57 are in development. Its guided projectiles have four wings folded in the casing and controlled by the actuator in the projectile’s nose section, using the energy of the airflow to steer themselves to the target. UDAR UGV – Unmanned ground vehicle based on the tracked chassis of the BMP-3 with the center hull raised to fit the DUBM-30 Epoch armed with 2A42 autocannon, 7.62mm PKMT machine gun, and Kornet-M ATGM. Vikhr UGV – Unmanned ground vehicle based on BMD-3 equipped with a smaller turret armed with 2A72 autocannon, 7.62mm coaxial machine gun and six anti-tank guided missiles 9M133M Kornet-M, three on each side of the turret. It can carry separate aerial and ground drones. Prokhod-1 – Unmanned mine-clearing vehicle based on the BMP-3 chassis. It is equipped with the anti-mine TMT-C trawl, and a remote weapon station turret with a 12.7mm machine gun. Cyprus – 43 delivered in 1995–1996. Indonesia – 17 BMP-3F have arrived on 26 November 2010. Another 37 BMP-3F delivered in January 27, 2014. Iraq – Application for 500. Iraq has purchased several hundred new BMP-3 infantry fighting vehicles. About three hundred combat vehicles will be delivered to Iraq in the period 2018 to 2022. Kuwait – 118 delivered in 1995–1996. A new contract was signed in 2013. Contract was executed on September 30, 2015. Currently it has about 200 in service. Libya – 14 9P157-2 tank destroyers in service. Morocco – 60 BMP-3 ordered from Russia to supplement the T-72BV. Russia – 720. Russia's Defense Ministry has ordered and received 200 new BMP-3s. 97 under modernization. More in production with Sodema sight. Sri Lanka - 45 used by Sri Lanka Army's Sri Lanka Armoured Corps. South Korea – 33 delivered in 1996–1997 to pay off Russian debt, and another 37 in 2005. Moscow is currently seeking their return. Ukraine – 4 in service. United Arab Emirates – 250 for Abu Dhabi and 402 for Dubai (of which 391 delivered in 1992–1997) with "Namut" thermal sight and other modifications. They are under further upgrade with modular armour "Kaktus" and UTD-32 engine. Venezuela – 130 BMP-3M, 10 BREM-L and some BMP-K ordered, first deliveries in 2011, completed in 2012. Saudi Arabia – Application for 950. Philippines – The Philippine Marine Corps is also interested for the BMP-3F. Greece – The Hellenic Army ordered 450 BMP-3 from Russia as part of a €1.7 billion deal, but cancelled the order in 2011. 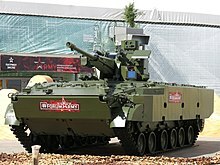 India – In 2012 Russia offered a transfer of the BMP-3 technology to the Indian Army if it would cancel its homegrown $10 billion Futuristic Infantry Combat Vehicle (FICV) program, but in November 2013 India rejected the offer. ^ "BMD-3 with Berezhok weapon system – Russia | Thai Military and Asian Region". ^ "Cloud from shrapnel: how controlled ammunition will strengthen the power of Russian armored vehicles – International News". ^ "BMP-3 IFV armored infantry fighting vehicle technical data | Russia Russian army light armoured vehicle UK | Russia Russian army military equipment vehicles UK". ^ a b "Russian Bakhcha-U combat turret from KBP will increase firepower of IFV Infantry Fighting Vehicle TASS 10404171 | weapons defence industry military technology UK | analysis focus army defence military industry army". ^ "Soderzhaniye" (PDF). Archived from the original (PDF) on 2006-11-03. ^ "Ob'yekt 688". Otvaga2004.narod.ru. Archived from the original on 2012-02-17. Retrieved 2011-11-12. ^ a b "Tankograd: BMP-3". ^ "Products Of Our Plant". Rmz.ru. Archived from the original on 2012-03-31. Retrieved 2011-11-12. ^ "Rostec Signs Agreements Worth 40 billion Rubles at the ARMY 2017 Forum – India Strategic". www.indiastrategic.in. ^ Debay, Yves (2004). VBL Panhard (in French). Histoire et collections. p. 92. ISBN 9782913903166. ^ Kavanaugh, Shane Dixon. 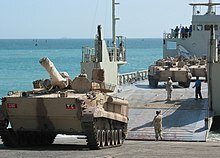 "Tiny UAE Tests Its Military Might In Yemen". Vocativ. Retrieved 12 August 2015. ^ John Pike (2010-05-13). "BMP-3 Fighting Vehicle". Globalsecurity.org. Retrieved 2010-08-24. ^ "Infantry Combat Vehicle BMP-3". Enemyforces.com. 1991-07-27. Retrieved 2010-02-07. ^ "Peleng – Special optoelectronics". Peleng.by. Archived from the original on 2012-03-31. Retrieved 2011-11-12. ^ "Vesna-K Sighting system". Kurganmash.ru. Archived from the original on 2011-09-27. Retrieved 2011-11-12. ^ "ИК-прицел «Содема» установят на БМП-3 - Еженедельник «Военно-промышленный курьер»". www.vpk-news.ru. ^ "IDEX 2009 – More firepower on land and water". Janes.com. 2007-02-22. Retrieved 2010-08-24. ^ "SOFEX 2010 – Galleries". Janes.com. Retrieved 2010-08-24. ^ "Russia Develops Additional BMP-3 Variants". April 11, 2013. ^ New AU-220M combat module for Russian BMP-3 IFV. Army Recognition. 6 June 2018. ^ "New BMP-3 IFV fitted with a gun mount system AU-220m armed with a 57 mm automatic cannon 10909152 | RAE 2015 News Official Online Show Daily Coverage | Defence security military exhibition 2015". ^ "Russian BTR-82 armoured personnel carrier could be upgraded with AU-220M turret 57mm cannon TASS 10810161 | weapons defence industry military technology UK | analysis focus army defence military industry army". ^ "BMP-3 Infantry fighting vehicle". Archived from the original on 18 May 2015. Retrieved 1 February 2015. ^ a b "Боевая машина пехоты БМП-3. Описание. Технические характеристики. Применяемые агрегаты производства АО ММЗ Знамя". www.znamia.ru. Archived from the original on 2015-04-18. Retrieved 2015-05-18. ^ ARG. "BMP-3 Infantry Fighting Vehicle". Military-Today.com. Retrieved 2010-08-24. ^ "BMP-3 Infantry Fighting Vehicle (Russia)". Historyofwar.org. Retrieved 2010-08-24. ^ "BMP-3 Infantry Combat Vehicle – Army Technology". ^ "BMP-3M Infantry Fighting Vehicle (IFV) – Army Technology". ^ "Kurganmashzavod. Fire power". www.kurganmash.ru. ^ "BMP-3 Upgraded infantry fighting vehicle". Kurganmash.ru. Archived from the original on 2011-11-14. Retrieved 2011-11-12. ^ "BMP-3M IFV Armoured Infantry Fighting Vehicle technical data sheet specifications pictures video 12803164 | Russia Russian army light armoured vehicle UK | Russia Russian army military equipment vehicles UK". ^ "BMP-3M with Ataka 9m120-1 anti-tank guided missile Army-2017 12508172 | Army-2017 Show Daily News Coverage Report | Defence security military exhibition 2017 daily news category". ^ "BMP-3K Command post vehicle". Kurganmash.ru. Archived from the original on 2012-03-31. Retrieved 2011-11-12. ^ "BMP-3F IFV amphibious tracked armored infantry fighting vehicle | Russia Russian army light armoured vehicle UK | Russia Russian army military equipment vehicles UK". ^ "BMP-3F Marines Fighting Vehicle (MFV) - Naval Technology". ^ "BMP-3F Marines fighting vehicle". Kurganmash.ru. Archived from the original on 2011-11-26. Retrieved 2011-11-12. ^ "BT-3F Amphibious Armored Personnel Carrier | Military-Today.com". ^ "Armor: BMP-3 Forced To Improve Or Die". ^ "BRM-3K Reconnaissance Vehicle | MilitaryLeak". ^ "UralVagonZavod shows BMP-3 IFV with 57 mm gun – Defence Blog". ^ "Kurgan/Rubtsovsk BRM-3K Rys (Lynx) combat reconnaissance vehicle (Russian Federation)". Articles.janes.com. 2007-07-23. Archived from the original on May 3, 2012. Retrieved 2011-11-12. ^ "RUBTSOVSK MACHINE BUILDING PLANT". rmz.ru. Archived from the original on 17 November 2015. Retrieved 26 November 2014. ^ "PRODUCTS OF OUR PLANT". rmz.ru. Archived from the original on 31 March 2012. Retrieved 26 November 2014. ^ "MoD Finishes BMP-3 Dragun Trials". www.defense-aerospace.com. ^ "BREM-L Armoured recovery vehicle". Kurganmash.ru. Archived from the original on 2011-10-15. Retrieved 2011-11-12. ^ Servaes, Army Recognition Alain. "BREM-L description Pictures picture photo image Russian light armored armoured recovery vehicle Russian véhicule léger blindé de dépannage Russe". www.armyrecognition.com. ^ Consulting, Don Busack. "BREM-L Walk Around Page 1". www.primeportal.net. ^ "BMP-3 Khrizantema Khrizantema-S 9P157 technical data sheet specifications description pictures". ^ "Khrizantema-S". Konstruktorskoye Byuro Mashynostroyenia. 2002–2008. Archived from the original on August 21, 2004. Retrieved 2008-11-06. ^ Servaes, Army Recognition Alain. "BMP-3 Krizantema BMP3 Krizantema Picture pictures Photo Image light infantery anti-tank armoured armored fighting vehicle Army of Russia véhicule blindé léger antichar de combat d'infanterie Armée Russe". www.armyrecognition.com. ^ "Южный округ получил новые ПТРК – Еженедельник "Военно-промышленный курьер"". Retrieved 26 November 2014. ^ "Kornet E Laser Guided Anti-Tank Missile". Defence Update. 2006-07-26. Archived from the original on 2008-07-05. Retrieved 2008-11-17. ^ "BMP-3 Based multipurpose chassis". Kurganmash.ru. Archived from the original on 2011-09-27. Retrieved 2011-11-12. ^ "Sprut-SDM1 Amphibious Light Tank | Military-Today.com". ^ "2S31 Vena Self-Propelled, Tracked Mortar Carrier Combat Vehicle – Russia". ^ "2S31 Vena self-propelled mortar carrier data sheet specifications information intelligence pictures". ^ "New Russian-made Derivatsiya-PVO 57 mm anti-aircraft artillery system ready for tests in 2017 | Thai Military and Asian Region". ^ "Russia Derivatsiya-PVO anti-aircraft artillery system to undergo state trials in 2019 | March 2019 Global Defense Security army news industry | Defense Security global news industry army 2019 | Archive News year". ^ "Army 2018: tests began in Russia of guided ammunition for 2S38 Derivatsiya air defense system | Army-2018 News Russia Online Show Daily | defense security exhibition 2018 pictures gallery". ^ "Russia to develop anti-drone shrapnel ammunition". TASS. ^ "UVZ to unveil modernized BMP-1 with 2A72 cannon at Army 2018". ^ "Russia has developed low cost programmable air explosive ammunition that can be detonated by laser remote control. | jqknews". ^ "Russian Udar UCGV Unmanned Combat Ground Vehicle will be a fully autonomous robotic system TASS 12707161 | weapons defence industry military technology UK | analysis focus army defence military industry army". ^ "Russian army will use Vikhr UGV unmanned ground vehicle BMP-3 IFV robotic military system 12603174 | weapons defence industry military technology UK | analysis focus army defence military industry army". ^ "Russia has serious ambitions for military robotics – Business Insider". Business Insider. ^ [++https://www.youtube.com/watch?v=TNYmzT22524 "Vikhr: Reborn as Robot. Russian UGV equipped with drones and a precision battle module"] Check |url= value (help) – via YouTube. ^ "Bombs Away: New Russian Robot Offers Remote Demining (VIDEO) – Sputnik International". ^ "Prokhod Armour-plated Minesweeping Robot | MilitaryLeak". ^ "-". Vedomosti.ru. Retrieved 26 November 2014. ^ Kementerian Pertahanan Ri. "Tank BMP-3F Resmi Perkuat TNI AL" (in Indonesian). Dephan.go.id. Retrieved 2011-11-12. ^ JPNN. "37 Unit Tank Amfibi BMP-3F Lengkapi Koleksi Korps Marinir". Retrieved 26 November 2014. ^ Pike, John. "Kuwait – Army Equipment". www.globalsecurity.org. ^ "ЦАМТО / Новости / Россия завершает выполнение последнего контракта на поставку Кувейту БМП-3". www.armstrade.org. ^ "Russia completes BMP-3 infantry fighting vehicles delivery to Kuwait — manufacturer". ^ "Россия завершила поставку БМП-3 в Кувейт - Еженедельник «Военно-промышленный курьер»". vpk-news.ru. ^ "Russians delivers armoured fighting vehicles". ^ "BMP-3 | Russian Military Analysis". Warfare.ru. Retrieved 2011-11-12. ^ "Russian Defense Ministry to get more than 200 new BMP-3 armored infantry vehicles". ^ "Three-year contract for BMP-3 supplies fulfilled completely : Ministry of Defence of the Russian Federation". eng.mil.ru. ^ "Sri Lanka (LTTE)". International Institute For Strategic Studies. March 15, 2007. Archived from the original on June 4, 2012. Retrieved March 15, 2007. ^ "ЦАМТО / Новости / Россия завершает программу модернизацию части парка БМП-3 армии ОАЭ". www.armstrade.org. ^ "Venezuela; Army incepts new batch of BMP-3". dmilt.com. Archived from the original on 2 December 2013. Retrieved 26 November 2014. ^ "Филиппины проявляют интерес к российской БМП-3Ф". ^ "EU-Russia Watch 2012" (PDF). University of Tartu Press. April 2012. Archived from the original (PDF) on January 7, 2015. Retrieved 1 February 2015. ^ "Russia offers to India to transfer technology of BMP-3 AIFV armoured infantry fighting vehicle". 21 December 2012. Retrieved 1 February 2015. ^ "India Rejects BMP-3 Offer, Will Maintain FICV Program". Springfield, Virginia: Defense News. 10 December 2013. Retrieved 1 February 2015. Wikimedia Commons has media related to BMP-3. This page was last edited on 17 April 2019, at 21:43 (UTC).